I love photos and videos that show the microscopic. It’s all God’s creation and to be able to see the smaller things unusually not observed by the unaided eye just gives me a thrill to peek into His smaller creations that are just as magnificent as the Alps or the change of seasons or the constellations. Here is a short clip of things crystallizing. It’s fascinating. “Crystallization2” features beautiful macro time lapse footage by Yan Liang from Beauty of Science of various types of crystals as they form”. The subjects of this project were droplets of saturated aqueous solutions containing various inorganic salts (e.g. table salt, sodium sulfate etc.). The evaporation of water initiated the crystallization processes inside the droplets, which were captured by time-lapse photography. Hope you enjoy these beautiful crystallization processes! A single droplet contains the wonders of nature. Wonders of nature? No, a single droplet contains the wonders of God’s omniscient, omnipresent, infinite mind, that’s the fascinating part. In 2010 the famous mathematician Benoit Mandelbrot spoke at TED shortly before his death. At that TED talk, Mandelbrot developed a theme he first discussed at TED in 1984 shortly after discovering fractals and measuring roughness. He talked about the extreme complexity of roughness, and the way that fractal math can find order within patterns that seem unknowably complicated. When he speaks of measuring roughness, he means, how do you measure a coastline? or a boulder-laden, jagged mountaintop? 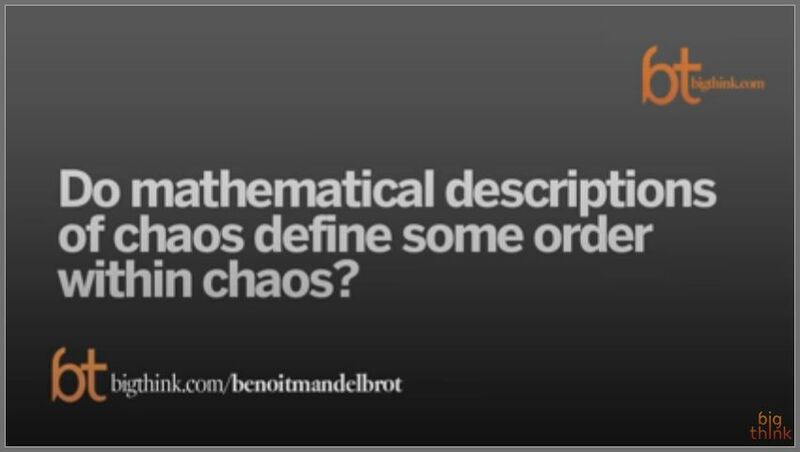 Maths should help with that, because maths is a system that finds order in ‘chaos’. but until Mandelbrot discovered fractals, maths hadn’t. If you cut a cauliflower floret, you get an exact replica of the whole cauliflower, but smaller. No matter how small you cut it, it’s always the smaller of the whole. The experience of humanity has always been that there are some shapes that have this peculiar property that each part is like the whole, but smaller. Now, the question is, why? Christians know that God is orderly and the universe He created has his fingerprint on every single molecule. (Genesis 1:1, Colossians 1:17). Even non-saved people know this. (Romans 1:18-20). You see, there is no chaos. Even in the seeming chaotic jumble of a coastline, or the area-rich but mass-poor lung with all its branches, there exists order. It is measurable, orderly, and knowable. Mandelbrot’s talk was witty, engaging, and easy to understand. I recommend it. When you look at the Mandelbrot set and see its chaotically intricate and beautiful design, you can’t help but feel that there is something larger than life going on here–that you are staring right at some unexplainable cosmic mystery. And that is the beauty and the alarm of Romans 1. When science or mathematics professors peer into the cosmic unknowable, their conscience tells them that it is knowable, through God. The alarm is that the conscience and the creation alarm the human who attempts to deny God, and that God is peering back at them. For what can be known about God is plain to them, because God has shown it to them. For his invisible attributes, namely, his eternal power and divine nature, have been clearly perceived, ever since the creation of the world, in the things that have been made. (Romans 1:19-20). For believers peering into these things, it is majesty and greatness we see, the infinite God in His majestic hand creating all things, and His Son sustaining them. (Genesis 1:1-2, Colossians 1:17). What are the implications of seeing order where there should be no order? Why has been “The experience of humanity has always been that there are some shapes that have this peculiar property that each part is like the whole, but smaller”? The implications! Oh, the implications. This Big think interviewer asked Mandelbrot this question at a different interview. Mandelbrot was asked this very question, and of course, he hedged the answer. First, came the picking on semantics answer, or, I do not think this word means what you think it means, as Inigo would say. The rules which generate many fractals, such as models of natural fractals such as clouds and mountains, and other phenomena, are evolved chance?? and are not chaotic in the modern sense of the word, they are chaotic in the old sense of the word, which doesn’t have any specific meaning. I don’t like to discuss these questions of terms. Chaos came from something very confused which helped it gel. It’s used of a biblical name in a certain sense…it forces us to ask certain implications which are not important in mathematics. Mandelbrot saying he did not like to think of the implications is akin to the seared mind dancing away from proximity to God just as a drop of oil skitters across a hot pan. In this post, my goal was to awaken you to the beauty of creation in the microscopic spheres, specifically, fractals. It was additionally to illustrate the clarity with which the Lord GOD displayed His invisible attributes. Third, it was to show how the unsaved mind knows but doesn’t care to know, as the Romans verses state. Finally, some praise for the omnipotent and infinite mind of the Creator!